While there are plenty of Easter Eggs hidden away in Star Wars: The Force Awakens, one of the easiest to spot is a direct call back to A New Hope. You may want to turn back if you haven't seen the movie yet, as this is definitely a Spoiler. When Finn is inside the Millennium Falcon, he takes a seat, accidentally turning on the old Dejarik holochess board. It is a scene that required some pretty cool stop-motion animation. And we have a new featurette that show's how this moment came together. This Force Awakens stop-motion animation scene was created under the guidance of VFX wizard Phil Tippett. In the scene, Finn seems quite amazed at the forty year old technology, staring at it as though he's never seen such a thing before. And it certainly attracts Chewbacca's attention. Perhaps he's thinking back to better days, before he got wrapped up with the Rebellion. This cool throwback has no real impact on the story being told. It is just there for fans. In this cool new video, we watch as Adam Savage drops by Tippett Studio. There, he gets to watch the team responsible for this Easter Egg bring it all together. Phil Tippett joins his team to discuss the process of animating the creatures that are used by the two individual opponents during game play. Tippett also talks about working on the original 1977 release of Star Wars: Episode IV - A New Hope. In making Star Wars: The Force Awakens, director J.J. Abrams wanted to use practical effects as often as he could. While the Dejarik holochess board could have easily been recreated using CGI, he decided he wanted to go old school, insuring that it looked as authentic as possible to the original. Perhaps recreating this iconic Easter Egg inside computer would have been faster and easier. But would it have been as cool? Probably not. Phil Tippett goes onto explain that putting this quick scene together wasn't as simple as dusting off the old models. "We got a call from [Lucasfilm president] Kathy Kennedy saying that they wanted to restore the original chess set from Star Wars, and the problem was that the characters that we had made, you know, close to 40 years ago, were in a horrible state of disintegration. They were made out of a rubber that disintegrates over time, and turns into like graham crackers. The original holochess pieces were on a trophy presented to George Lucas ages ago. And they were beyond repair. The Tippett team had to scour the archives and use photogrammetry to reconstruct the characters for 3D printing. These new characters were constructed out of silicone, and hopefully they will last a bit longer than the old originals. In another interesting Easter egg tidbit, the holochess game that gets turned on in Star Wars: The Force Awakens is a continuation of the match seen in Star Wars: Episode IV - A New Hope. Says Tippett. "We elected to pick up where we left off ... and we just swapped out who wins this time/"
Watch Star Wars: The Force Awakens closely, and often, you're sure to be rewarded with plenty of cool hidden references and items from previous movies. 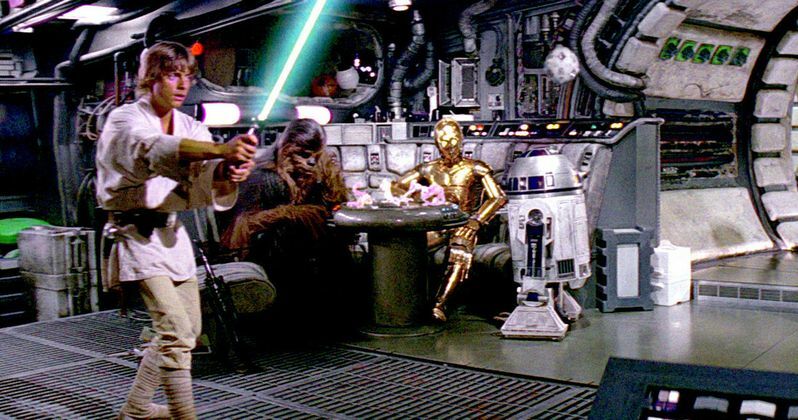 Also included in these scenes are the Jedi training sphere that Luke used in the same scene from Star Wars: Episode IV - A New Hope where the Holochess is played. You can check out how it all came back to life in the video below.